These instructions will guide you through installing Pootle and its requirements in a virtual environment. If you only want to have a sneak peek of Pootle then the default configuration and the built-in server will suffice. Follow the Pootle installation video tutorial, which starts after some basic setup, to see the installation steps in action and expected results. Use either a MySQL or PostgreSQL database. Before installing please ensure that you have all the necessary requirements. All of the Pootle requirements have been installed. We’re using SQLite as it’s easy to setup. We’re setting up the essential parts of Pootle including Redis, and RQ Workers. This is a test installation on a single server, and not optimised for production use. In order to install Pootle first create a virtual environment. The virtual environment allows you to install dependencies independent of your system packages. for versions of virtualenv prior to 1.10, you may need to call virtualenv with the --setuptools option, to ensure the correct environment. Once activated the virtual environment name will be prepended to the shell prompt. This will also fetch and install Pootle’s dependencies. 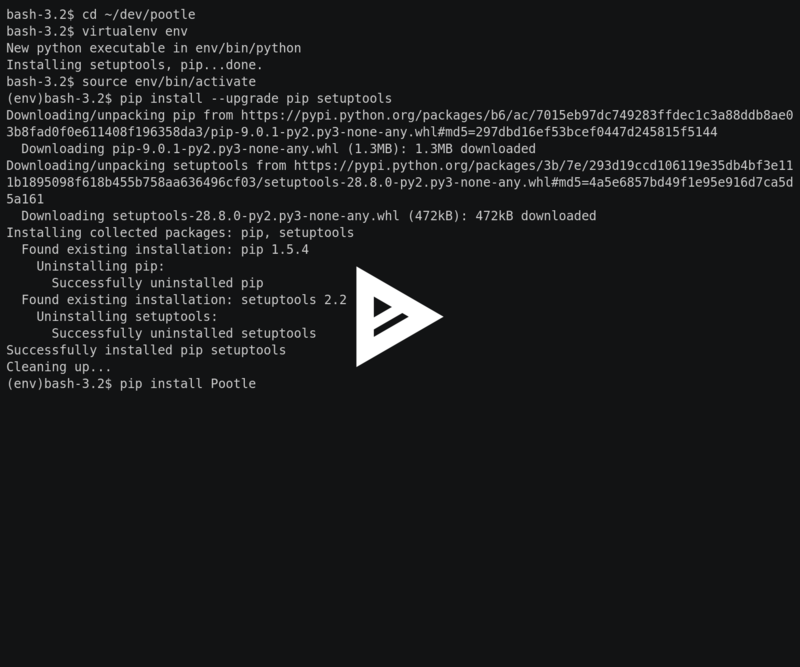 pip requires –pre to install pre-release versions of Pootle, i.e. alpha, beta and rc versions. You may require –process-dependency-links if Pootle depends on unreleased versions of third-party software. To verify that everything installed correctly, you should be able to access the pootle command line tool within your environment. By default the configuration file is saved as ~/.pootle/pootle.conf. You can pass an alternative path as an argument if required - see the init command for all of the options. This default configuration is enough to experiment with Pootle. Don’t use this configuration in a production environment. The initial configuration includes the settings that you’re most likely to change. For further customization, see the full list of available settings. You will need to have an RQ worker running to complete this. Alternately, you can use the --no-rq. Running initdb will take some time as it will create the default projects and stores. Pootle needs at least one user with superuser rights which we create with the createsuperuser command. All users are required to verify their email before logging in. If you wish to bypass this step you can use the verify_user command. There are serious drawbacks to using runserver. Never use it in production. And the server will start listening on port 8000. Pootle can then be accessed from your web browser at localhost:8000.